Let’s talk fine motor skills before I show you the mazes unit I’ve been working on! Why is strengthening the small muscles in your kiddos’ fingers so important? Well, not only do those tiny muscles help with a number of every day skills, such as buttoning up a shirt, cutting, and constructing with Lego, they also help to develop good pencil control in preparation for writing. 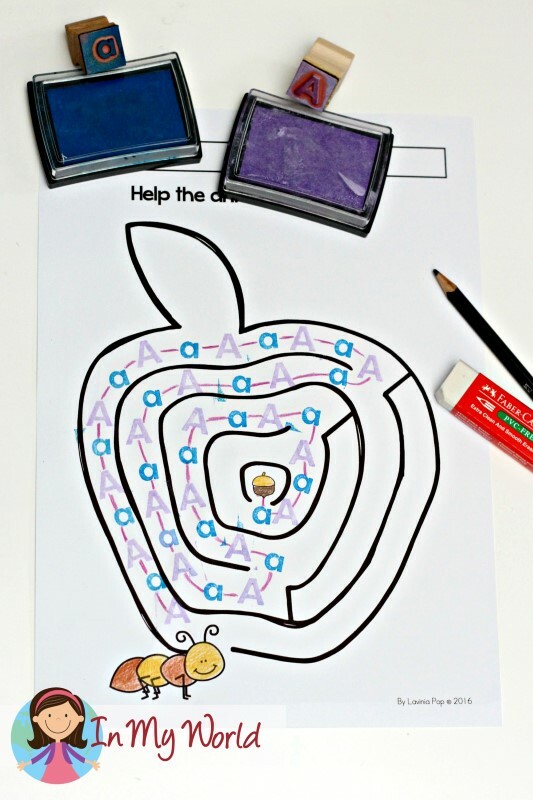 Mazes are a really fun way to develop pencil control because they provide kiddos with the opportunity to practice moving their pencil along a path, stopping at speciﬁc points, and changing direction before continuing towards the end. Sooo… I happened to find some very cool maze clip art and decided to make a set of picture mazes. But wait, it gets better: these are beginning sounds mazes! How cool is that!? 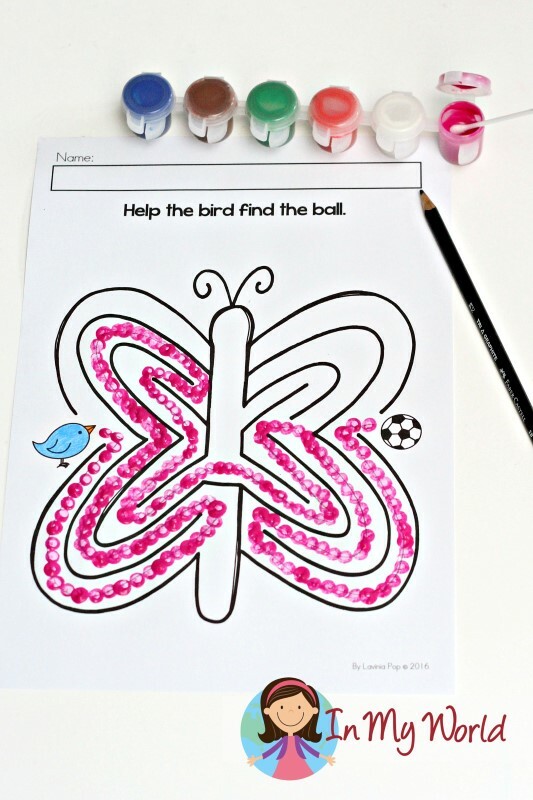 You can focus on beginning sounds and build fine motor and pencil skills all in one fun, hands-on activity. Filip has been very busy playing with his cousins, who we are babysitting for a few days, and so I decided to try out the mazes myself. Of course, you would ask your kiddos to trace the path with their finger first, then with a pencil. I’m a bit more clever than your average preschooler or kindergartner, so I skipped the finger-tracing part and went straight to tracing the path with a pencil. For the apple maze pictured below, I used upper and lower case stamps to stamp along the pencil line. I then rubbed out the pencil line and connected the letters with a purple dash. To finish off the butterfly maze, I used q-tips dipped in paint. This took much – much – longer than expected, but it was heaps of fun! You could even ask older kiddos to make patterns with different coloured paint. 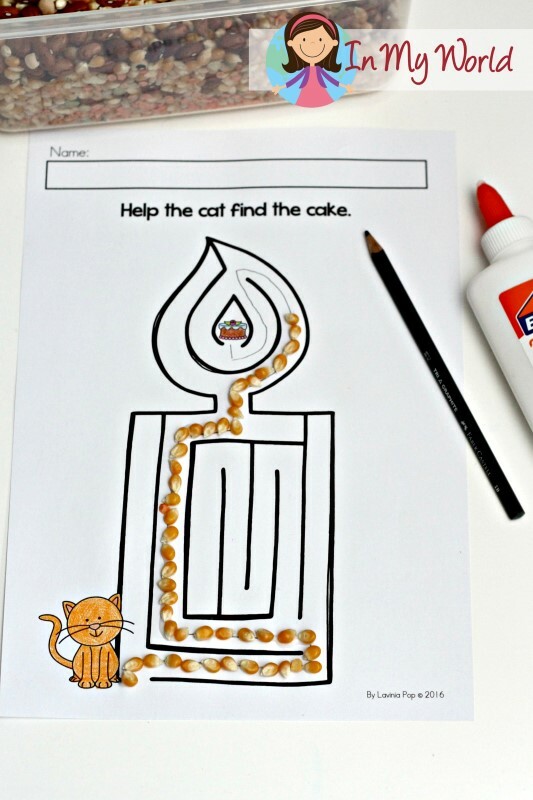 To finish off the candle maze pictured below, I decided to get creative and use some c-c-corn to help the c-c-cat find the c-c-cake in the c-c-candle maze… ‘Cause there’s no such thing as too much beginning sounds practice! Folks, if you think that your kiddos will finish these pages too quickly, think again! I mean, yeah, they probably will if they only use a pencil! But get creative and have them use different finishing touches for each maze! Use stickers, finger paint, scented markers or glue on different things to reinforce the focus beginning sound even more! If you have ideas different to what I’ve written, I’d love for you comment below and let me know what they are! 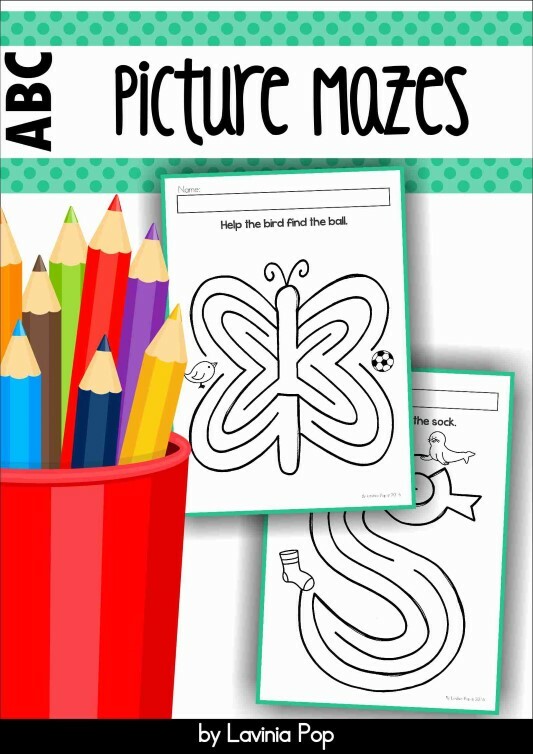 If you’d like to purchase the complete Picture Mazes unit, click the picture below to take you to the listing in my TpT store. I’m so excited to use mazes with my preschoolers. GREAT idea! Buna Lavinia! Sunt foarte reusite materialele tale. Poate mai faci si in romana, free sau nu.